We have dedicated premises for primary food packaging producing facilities. 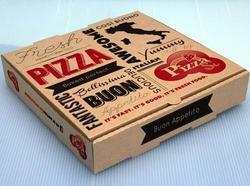 We manufacture and supply huge nos of superior-qualityCorrugated Pizza Boxes. They are made from food grade paper and all other hygienic factors are taken care in its manufacturing. It is made attractive with high quality printing and graphics. 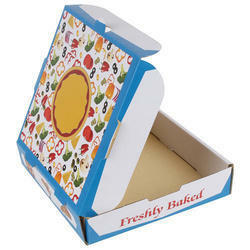 They are used by pizza eateries and outlets for the purpose of packaging pizza for home deliveries or takeaways. 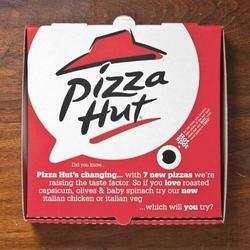 They help in keeping the pizza warm and fresh till the time it gets delivered to the client's doorstep. They are sturdy and reliable. They prevent the food item from falling or getting damaged during transit. They are available in large, medium and small shapes with attractive graphics and company logos. They are delivered to clients within the specified time-frame at affordable rates. Available in different styles (Dominos / Pizza Hut / others). Can be made in different qualities as per paper used. Can be made upto 4 color branding. Can be made with white inside. Can be made in different sizes from 6" to 20". Can be made with outer lamination only.